Wedding Umbrellas for that special day - See more! Wedding umbrellas give that extra special look on that extra special day. Stay dry and stay out of the sun on your wedding day. Looking for wedding umbrellas? You've come to the right place. Wedding umbrellas are something we specialise in up here in Umbrella Heaven. A huge amount of planning often goes into a wedding. But the one thing often forgotten is the possibility of rain on the big day. So, don't let the weather ruin your day. We're proud of our collection of beautiful wedding umbrellas for weddings (of course!). We have budget priced golf size wedding parasols in black, white or ivory. 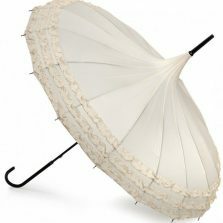 Not only this, but we have some gorgeous frilly and lace wedding umbrellas. Which not only look beautiful and act as a great prop for cheeky photos on a sunny day but are also completely waterproof in the rain. There are many things to remember when planning a wedding - a wedding umbrella is definitely one. We have beautiful pagoda shaped, and even a heart shaped wedding umbrella. 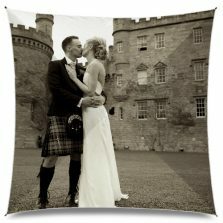 We have tried to offer a bit of something for everyone on that special day with style, elegance and some outright fun designs. Although specifically chosen with weddings in mind, in truth any one of our wedding umbrella collection would actually be ideal for any special occasion - whether it's a Christening or a day out at Ascot. Whether you're looking for just a few frilly wedding parasols for the bride and bridesmaids or a hundred cheap and cheerful wedding parasols to keep the whole wedding party dry. Leave nothing to chance - browse through our wedding umbrellas category at your leisure. Need help or advice? Don't hesitate to email us at info@UmbrellaHeaven.com or call us at 01525 382938 (+44 1525 382938 if calling from outside the UK).